Insomnia is a common sleep disorder, although that’s scant comfort when you’re groggy and trying to get through the day on little rest. The National Sleep Association indicates that more than 50 million people suffer with some kind of sleep issue. In fact, at least one in three people will have a problem with a sleep disorder in their lifetimes. Approximately 30 percent of adults have short-term insomnia, and 10 percent have chronic insomnia. Women tend to have more difficulty with sleep disturbances than men. 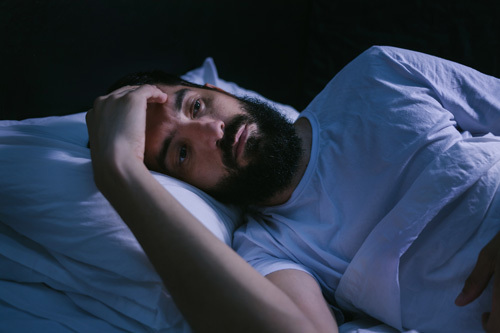 For people completing treatment, the percent of insomnia sufferers is much higher: between 25 and 75 percent of people in recovery often struggle due to a sleep debt. Insomnia often causes lethargy, fatigue, mood disturbances, difficulty concentrating, and decreased performance of daily activities. We often think we can skate by on a few hours, but the average person is healthier when he or she sleeps seven-to-nine hours a night. It’s easy to hear those numbers and become even more concerned about your lack of peaceful slumber. The important thing to remember is that insomnia during recovery is often due to your circadian rhythms and other systems recalibrating after treatment. Over time and with proper sleep hygiene practices, the problem will be resolved. Sleep was once considered a passive state when the mind and body shut off to recuperate from the day’s events. Modern research indicates our brains actively cycle through specific and complex patterns during various phases of the sleep process, designed to restore both the body and mind. Insomnia is defined as an interruption of these phases. Primary insomnia isn’t caused by or associated with a medical condition, a psychiatric problem, or medication. Typical reasons might be due to circadian rhythm disruption caused by alternate shift work, negative environmental factors, traveling, or emotional or physical stress. Secondary insomnia is caused by emotional, mental or physical health conditions that interrupt sleep; or tobacco or caffeine. If you have trouble with sleeplessness for three nights or more per week, lasting for up to 30 days, you’ll likely be diagnosed with insomnia. If you’re suffering from insomnia and in recovery, it’s unlikely your care provider will suggest over-the-counter sleep aids or prescription sleep medication. Certain studies indicate that these choices can be habit-forming, affecting the brain as cocaine might. While the “drive to sleep” is controlled internally, many external factors can contribute to sleep issues. It’s quaint to think that a glass of warm milk may be all you need for a good night’s rest, but science supports many natural methods for getting better shut-eye. Pour a glass of warm milk. Okay, we joked about it, but it’s true: since milk has tryptophan, an amino acid that prompts sleep, slightly warm a small cup of it and season with nutmeg, which is supposed to induce calm. Eat lightly at dinner. Time your last meal about two hours before bedtime to give your system plenty of time to start the digestive process so you’re not disturbed during sleep. Avoid citrus fruits, fatty or spicy foods, and of course, caffeine (this includes chocolate!) to prevent heartburn and intestinal distress. Exercise—but not too late. You learned during treatment the importance of regular exercise for a variety of reasons, and sleep ranks at the top. We all can get too busy to exercise, so if you notice a correlation between lack of movement and lack of sleep, resume your fitness habit and see what happens after a week or two. Just make sure not to workout excessively before bed. Choose a short, relaxing yoga sequence instead. Create a haven of sleep. Where you sleep should be calm, quiet, cool, and dark. Eliminate clutter; put away electronics; lower the temperature to 65 degrees; splurge on cozy pillows, sheets, and blankets; and use darkening shades or blinds to encourage nothing but sweet dreams. Spend as much time in daylight as you can. This prompt—whether natural or induced by a light therapy device—calibrates your circadian rhythms. Consider supplements. Your care provider may suggest non-reactive supplements such as magnesium, calcium, or Valerian root. These are all habits of good sleep hygiene. As you adapt to each one, you’ll establish better conditions to promote more effective rest. And while insomnia won’t go away overnight, you should notice a difference within a few weeks. Whether you choose Twin Lakes’ inpatient care or intensive outpatient services, our experts provide aftercare services to ensure your good health. Learn more about continuum of care plans and how yours can be adapted to address challenges with sleep and other concerns. To learn more about our detox and treatment programs at Twin Lakes, alcohol rehab Atlanta GA, please use the convenient contact form.